James Robert Watson posted on his site an interesting bit about the Verizon logo that I’d like to paraphrase for you. Basically, it’s that Verizon has a logo with one graphic too many. Verizon’s logo is made from familiar and rather ordinary ingredients — masculine black and red colors (think NASCAR), Helvetica Black type (lightly modified), and a red z, which is the visual trick and vaguely resembles an electric spark. It also has a big, red check in a different line weight, with different angles, that looks like the corner of a box. But why does the check exist? It has no useful association; it establishes no tone or air, and it conveys no information. Worse, it’s not benign — it competes with the z; both are red and both are angled. Basically, you have two focal points. This becomes evident . . .
. . . when you remove the check . . . The logo is simpler and stronger. A simpler logo has functional benefits, too. Because it’s triangular and mostly air, the red check occupies, and deadens, a lot of space. Without it, Verizon will fit many formats that are otherwise awkward to design, and it can be bigger. Here it is on a service van . . . The thing to keep in mind as you design is that every element must contribute to your image, and if it doesn’t, don’t use it. The ideal image is the simple one in which every element — a line, a space, a color, a type choice — has a purpose that you can articulate. When you find that your design isn’t quite “working,” suspect two causes — either the goal hasn’t been clearly articulated, or the graphics contain a rogue element like Verizon’s check. Can you name other examples? This entry was posted in Critique, Design, Logo design. Bookmark the permalink. ← How long should your story be? I’ve had the exact same thoughts since the logo first appeared, and it still bothers me every time I see it. I remember hearing back in the late 90s that Verizon spent $300M+ to launch their new brand. A third of a billion dollars and that’s the best they could do? I’m guessing they had two designs they liked and couldn’t decide between them. I think the check mark does perform an important function in the Verizon logo. It lightens up an otherwise very heavy logo, making it more approachable and friendly. As you described it, without the check mark, the logo is “masculine” and “strong.” But that’s perhaps not entirely what Verizon is going for. John, are there any resources available with exercises to help with the verbalization process . . . something where those of us who never had formal design training could study an example, write our responses and then read the responses of trained designers? I understand the value of verbalization, but sometimes I have trouble knowing how to confidently apply that principle to my work in real life. I would like to have better skills in that area. I love the combinations of visuals and verbalizations provided in this post. They are very helpful. Couldn’t agree more. I’ve always thought the same thing; it puzzled me what the check mark was there for. I couldn’t agree more about the Verizon logo. The check has never made any sense whatsoever. I have had to use it numerous times in layouts with “family of sponsors.” Their logo is very awkward to use, and they ultimately have much less “presence” than the other logos adjacent to it. I’ve always felt that the Hyundai emblem lacks certain engineering integrity. It seems to have been crushed; this doesn’t fit my expectation for solidity in an automobile. I suspect that the shape was derived almost primarily from the requirement to be different from another “H” emblem. Perhaps their word logo would be worthy of consideration by itself; no emblem could be bold. Thanks for the thoughtful topic. We can save the world! If they really must use that huge, awkward, 90s-era check mark, then at least ditch the gradient that is so often reproduced incorrectly. I’ve seen signage where the gradient fades to white, even when its background is a different color, like grey, or a shade of white that is slightly off from the white of the gradient end. I’m sure that’s not in the usage guidelines, but considering how easy it is to ruin the looks of that gradient, I blame it on poor design. I hate it whenever I have to use the Verizon logo in my own design work. It’s awkward and ungainly and it pokes at everything around it. Thanks for this helpful exercise. It’s so obvious now. I agree completely. To me, it looks amateurish and “designed by committee.” And, unfortunately, it influences my perception of the whole company: amateurish, cluttered and unfocused. The Japan Airlines logo — I am not sure what’s going on with the gray under-swoosh, but it sure degrades the essence of the image, in my opinion. Perhaps it’s there to symbolize gray jet exhaust? I completely agree with your observation and agree w/Cynthia’s comment as being designed by committee. In some weird way, I wonder whether the red check mark is not a check mark at all, rather a line of energy bouncing from a satellite down to the letter “V” in Verizon. Bottom line: egads! In Cleveland, we have a super-bad logo on the Quicken Loans Arena, where the Cleveland Cavaliers basketball team plays. The owner actually had his son design the darn thing — a huge Q. Yikes! When I was living in New York City, Verizon (then Bell Atlantic and GTE merger) was promoting their new name and logo. I agree with everyone that the red check mark is not necessary, but at the time Verizon was using it to give emphasis to the letter “V” for Verizon parallel to its television commercials where people were shown holding up their fingers in a peace sign representing the “V” for Verizon. Because the name was a new brand, they were using this to reiterate the new name, ultimately leaving the “V” — or as everyone has referred to as the “check mark” — intact. I couldn’t agree less. The examples where the check was pulled make it very evident. Without the check, it’s — just another ho-hum, unimaginative, rectangular-word logo. In contrast, the check reserves a lot of room, which — identifies. Uniquely. I think logos should have one graphic element. From the pictures above, the only one where the check mark looks like it belongs is on the van. The check is in front of the logo and fills the vast space nicely — which appears as a nice design with the logo in it, instead of a logo designed to fill massive amounts of space. But on the first photo of the logo alone, you basically have a huge check mark looming above a logo. I have had that thought for years on this logo. The check is just in the way. Every project the Verizon designers work on they have to figure out how to work around this thing. The main logo is just fine, easy to deal with. It looks like a logo designed by a committee that had someone in it that didn’t know what they were doing but they had to listen to. I was good friends with a marketing manager at one of the companies that merged to become Verizon. The “check” you refer to was definitely intended to convey a “V” for Verizon. I think it has no value because the “V” couldn’t truly stand on its own as an iconic representation of the Verizon brand (i.e. the Apple logo alone in place of the Apple logo together with the word Apple, or the Nike Swoosh without the word Nike.) It wouldn’t look like a V, it would look like a check mark. I don’t hate the logo, but I think it could be refined to be more concisely iconic. If you look at the logotype first, then the logo, the check mark seems to make sense, adding a level of sharpness and energy to what is basically a very heavy, late 70s modernist logo. Frankly, I think they need a refresh . . . the logo seems to be the product of a committee, and a risk-averse one at that. After the brilliance of the Saul Bass ATT logo or even the contrasting textures of the defunct Lucent logo…this thing is a clunker. The graphic that bugs me the most is the big blue arrow in a white box that covers my icons in Windows Vista. Not sure if you have Vista but if you have a shortcut to Painter 11 on your desktop the icon is turned into a short black line protruding out of the white box. Does Microsoft really think we don’t know what an icon is yet? And need an arrow to show us? I think they were attempting continuity in the design of the desktop . . .
Couldn’t agree more on the Verizon logo. Probably client driven. One thing I have learned about logos or any other graphic design — the customer is always right, whether the designer agrees or not. The organization has to live with the design — we don’t. The check mark in question provides the symbolism of quality, the selected item/company, or the correct answer. None of this is conveyed in the bold and artistic Verizon logo by itself. The “check” or “V” on top of the Verizon is really not needed there. One element in the logo is enough to make it simple. I suggest modifying the top right and bottom left of the “z” to a triangle point to make it different from the original z of the font. As I was looking around for another assignment, I came across what may be a couple cases of worse than too much in a logo mark — too little. Have you seen these? I agree the whole logo is heavy, static and very anachronistic. The trick tries to add an element of dynamism, but only succeeds in looking awkward and lacking in finesse. Either way, it is hardly a suitable visual representation for what purports to be a dynamic, cutting-edge communications company. Maybe it’s in need of a makeover like NASCAR. It’s a V, all right. But it’s a V laid on the ground. Why not just lay a simplified Verizon along the right side to show that? Then the “route” and “connection” of the V will show itself. I’ve always thought it would look better without the checkmark. Was glad to read a description of that reasoning. The checkmark just looks out of place to me. It’d be a much stronger logo without! Be loathe to criticize another’s work if you’re unaware of the constraints and parameters the designer had to work under. Maybe the check mark is a little weak in contrast to the rest of the logo. But you know, it doesn’t seem to have hurt the company that much. How important is a “well designed” logo anyway? As long as the logo is consistently used, it seems to have been doing its job of strengthening the company brand. Of course, consistently using a logo effectively requires designers, so that is not to say design is unimportant. Just that the logo is a small part of the whole thing. Another aspect of the logo as always confused me. Why is the “z” singled out in red? When I first say the name, I read it as “very zone,” since it seemed that the “z” was marking a new syllable. In fact, I still call it that just for fun. @Justin: I actually like the Blaupunkt logo, mostly because it is really simple. Plus, “Blaupunkt” means “blue point” or “blue dot” in German, so the logo makes perfekt sense. 1. Size. I had the pleasure of working with a website that had sub-sites for the different carriers. When the Verizon logo had to be placed into the same area as other logos it ended up looking very small, because the V/checkmark had to fit in the box, too . . . and it ended up being a 70% white box with a little logo in the lower-left corner. This happens every time the Verizon logo is being used — the V takes up all the space. 2. Two focal points. I am not against the V per se, but it should either be removed or integrated into the logo better — and then you need to choose if you want the V or the z to be the focal point. Totally agree, the simpler the logo, the stronger the impact. A strong logo has power, tells a lot about the company! Sorry . . . but I don’t think the logo works without the check mark design element. Without the mark, it is a flat, static, dime-a-dozen design. The blocky text is not brought to life enough by the red “z”. Without the check mark, the design lacks dimension. The un-usefulness of the logo elements is evident on the signage of the sports arena in Little Rock Arkansas. It was originally named “Alltel Arena” and had an appropriately sized sign on the side of the arena. When Verizon bought out Alltel, they changed the name to “Verizon Arena” and tried to put the same-size sign in the same location. Wth the top element, they had to reduce the overall size of the sign, so it now looks like a postage stamp on the side of the building. I have thought the same thing for the longest time! And you want to talk about too many elements in a logo design? Look at the Pick Up Stix signage! Exactly! Thanks for bringing this up (made my day) because it’s been on my mind relentlessly, especially with all the advertising they do. I cringe each time I come across it. BTW, I’d like to see what others say about the Chevrolet logo. At the risk of offending the Chevy lovers on this site, I always thought the logo could be updated. My biggest complaint is that is seems oversize to begin with, and they use it in the same format for every car with that bronze, filled-in color and silver outline. it doesn’t gel with some cars whose colors and tints are almost offended by the logo emblem itself. This is your classic stylized name + icon. The icon is a “check” or what the rest of the English-speaking world calls a “tick,” as in, you get a tick for being correct. It is saying that to choose Verizon is to make the correct choice. Unfortunately, it is too cramped in the smaller applications. I like it on the side of the truck, because it is farther way from the stylized name and so better emphasizes the point they are trying to make. 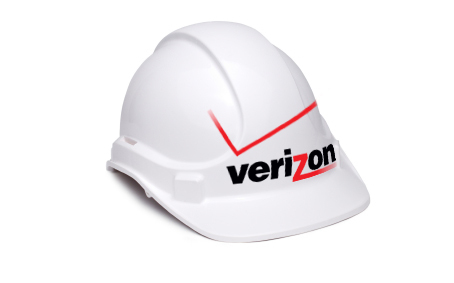 I believe that the designer was swooshed by fashion or tried to impress a V for Verizon. Completely agree! It has bothered me for a long time, and I am glad to see the check mark taken off on some of the elements. The logo looks so much stronger and more impactful without it. Great post. Commenting on the original analysis . . . this is soooo true! I’ve always felt the same way about the Verizon check . . . useless and distracting. Nice to know others agree. The V-mark and red z produce an uneasy tension. But I am not sure that’s a bad thing. I tend to agree with the previous poster, Tom Semmes, about the function of the logo in the grand scheme of things. Not to diminish its role, but the Verizon logo does the job in creating a unique “signature” for the company that the wordmark alone doesn’t quite do. Funny thing. As useless as that V element seems, the V-mark has become pretty recognizable, even without the wordmark. I’m not sure the tension that those elements created actually hurt the company’s brand. It may have even helped. Of the two red elements in the logo, I would take out the red z, not the check mark. I don’t think it looks like a box, either. I always assumed that it was another way of expressing the V for Verizon, and it looks like check mark. The check mark could mean to the consumer: 1) I approve of this product, or 2) Verizon takes care of your “to-do” list, so check it off as done (when you use Verizon). I don’t see the point of the red z other than that Verizon in all black is too heavy. The red z breaks it up, makes it more visually appetizing. Initially agreed with you, but on returning to the two van pics the complete logo does have a dynamic to it that the other doesn’t have. The complete logo tells more of a story . . . but I’m not sure what that story is. I have had to use the Verizon logo in broadcast television applications, and it is really a pain to work with. I have always believed that a good logo works in all media. The gradation on the check or V or whatever you call it is never reproduced the same way in all media, and the fact that the logo is “bottom heavy” makes it difficult to use in smaller applications. This logo needs to either be updated, or a clearer logo needs to be designed for various applications. As said before, the customer is always right, but it is up to designers to guide clients when it is apparent that the logo won’t work well under all the situations that the client wants it to. Frankly, to me it’s the Z that looks amateurish. V for Verizon (and suggesting a satellite feed, as mentioned above) should be the dominant accent. I’d suggest modernizing it and changing its scale, but the Z? It is the element, IMHO, that contributes no value. I like the check mark — I never saw it as a check mark but as a giant V in motion. It adds a lot to the logo. First, I was never crazy about the name “Verizon,” but that aside, I’d bet that someone (client?) thought that the base logo was “too generic” and that it “needed something.” Voilà! Behold, the check/V. Good design means removing everything not needed, not adding stuff until it gets approved by the committee. I don’t like changing logos every time a new designer pops up, but this one should have been better conceived at the start. I’ve never liked this design. It looks crowded and feeble rather than solid and dynamic. Pedestrian font choice plus prosthetic check mark tack-on = painful to behold. I live in Asia and had never heard of Verizon before, so when I first read this post I had no idea what type of company they were. My first thoughts looking at the logo were maybe a removal company or courier delivery company. These thoughts stemmed directly from the check mark, which I initially assumed was meant to be the edge of a box. Having since looked Verizon up on the web, I now know what they do. Even removing the check mark, I still don’t think the rest of the logo conveys communications or high-tech (the typeface is too heavy and industrial), but at least (to me) without the check mark it is less misleading. The Verizon logo reminds me of two companies that have been merged. They try to use elements of each logo, with the dominant company eventually reverting back to the original logo. AT&T incorporated Cingular’s logo into theirs very successfully. I don’t think that there is a single logo that can’t be dissected and improved. It comes down to what the public will accept. 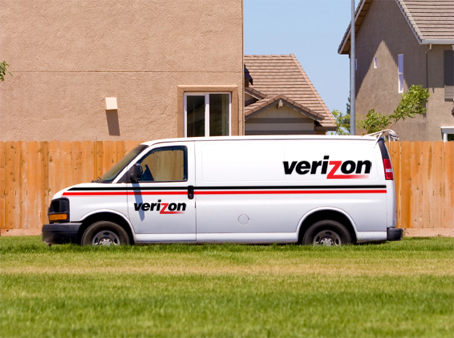 Like it or not, Verizon’s logo seems to work for them. It would be interesting to see what designs were rejected by Verizon before being too critical of the designer. Why not turn the Z into a red, v-looking check mark, rotate it slightly counter-clockwise and have the tail cut through the o? Too much, maybe? 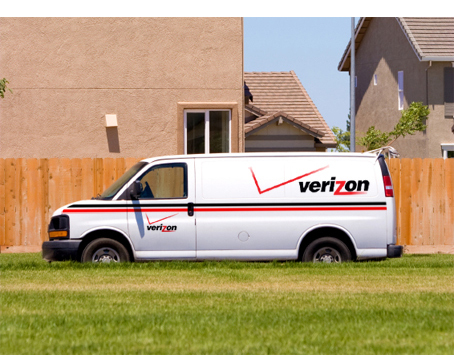 If the intention was to emphasize the V in Verizon, why have the z in red with an added graphical element? My eyes are immediately drawn to red z. The check mark does nothing but interfere with the logo and take up white space. I’ve always thought that about Verizon. Even though I have them as my cell service, I’m sort of embarrassed when the logo flashes on my screen. My credit union has the same thing going on, and a similar name. Take a design element and run with it; don’t combine five different ideas. I always thought the check mark was a nod to fiber-optics. Is this not a technology right in Verizon’s wheelhouse, if not close to it? I think the logo doesn’t work, but wasn’t it at one point part of the wording or something, or part of the original logo? I think they are trying to move in with a new logo and keep their original so that people don’t get confused. But I agree with all of you — the check is not necessary at all. It does compete with the rest of the logo. Hated it when it launched, still hate it today! I agree with Tom Semmes’ comment about Verizon reading as Very Zone. Breaking the word and making a new syllable with the z didn’t and still doesn’t make sense to me. And gradients? If you really want to drive a designer and production person crazy, just add a gradient to a logo. I feel it should be a strong mark with simple type for the name. In doing so, one or the other could work in the many media Verizon uses. Think of Cisco’s bars, Coke’s wave or any other iconic mark. We’re a decade into the 21st century, and Verizon’s logo needs to convey that. I noticed the comment up top about the sponsors, however, I’d somewhat disagree. When you have a bunch of sponsors all on the same page, the one that’s “isolated” will stand out, even by its awkwardness (is that a word?). I agree that it looks better without the check (tons better), but I would say that it can garner greater attention having it. This is not me saying that I actually like it the way it is with the check, just that it can have merit depending on how they do their advertising, event sponsorship, etc., in the big picture of corporate communications. I’ve been looking at that pointless V for years now questioning why it was there. It serves no purpose and fights for the attention of the viewer. It might possibly work if it were much, much smaller, but it still would fight with the z. Everybody seems to think this check is a V.
While I haven’t sought other support for this theory, I always thought that the check was supposed to be a visual analog to the marriage of vertical and horizon that comprise the name. So I always saw the check as a vertical line perpendicular to a horizontal line, ergo VERticalhorIZON. Having worked on projects where Verizon is a sponsor, I can confirm that it’s a strange logo to accommodate. The check takes up over half the available space to strip-in their logo, which results in the actual “Verizon” part being harder to read (i.e. ; smaller) than it should. The logo does not work either way. The check mark calms down the boldness of the font they used; without the check mark it’s just too bold and quite frankly frightening. If I had to pick, I would go with the check mark. However, I agree that the check mark is a separate element, but somehow it brings a balance to the overall space and adds a clear distinction to the logo. I still hate it, though. There is one benefit to this “checkmark” though. Whenever I see it, it subconsciously reinforces their marketing strategy that they offer the most national coverage. After 60+ comments, I think we need to look at this question in a different way. Now that we know that the check is supposed to be a nod to the V, it’s no longer about whether the V symbol belongs or not. The new question is how could this V be utilized in a more effective way. Obviously, it represents something positive to the company and their mission, or else it wouldn’t appear prominently in their logo. As designers, we are problem solvers. Now that we have more information, our attention should not be focused on if the logo looks better with or without the V, but rather how to solve the conundrum of incorporating the concept of the V in the logo. Just my two cents. I think the problem is both the check mark and the z — neither components of the logo do very much for the identity. When you remove the elements, you see clearly how little they do. I think we are mistaking the cleared area without the check mark as a better design, simply because with it the logo is worse off — but that doesn’t mean it’s a good logo. Emphasizing a letter (V, or z in this case) is not necessarily a good thing. We only know that the company is a phone company because we encounter it everywhere, not because the logo intuits it. And, in general (there are exceptions, I know), I think the logo should be representative of the company/industry, even in an abstract or subliminal way. Couldn’t agree more that this is a cluttered, uninspired and downright ugly logo. NASCAR’s logo is rainbow colored. I have a strong gut reaction against this logo, with or without the extraneous, angled check. Think of Sprint and AT&T’s visual identities. Aren’t they just so much more pleasing than Verizon’s? Verizon still dominates the market, though (although I don’t know which way it’s trending). I wonder what the logo requirements were. Sure, many designers who understand principles of design could do better. But who believes that a company as big as Verizon would let anyone distill their identity into one graphic without oversight? I may not like the logo, but I only have part of the story: the final product. Assuming that the designer(s) who created this worked through many variations, then some process lead to this result. It might work well — for whatever Verizon was thinking at the time. Maybe design, creativity or practicality weren’t at the top of their list. Maybe they were, but changed with iterative reviews. Maybe we could say better if we knew what they rejected, and why. Yes, Verizon’s check mark is not needed. I also agree with Mark Bernardo (above), who comments on the crushed H for Hyundai. My feeling is that a Hyundai auto is not reliable because of the impression that the logo gives. Also, I find Nevada Energy’s new logo weak, because the lower case “nergy” text seems so lacking is substance. Could have used small, upper case “NERGY.” Also, NE’s logo has some non-relevant stuff in the background, like the checkmark in Verizon. While I agree that the “old” logo is dated, Verizon has updated it within its business and wireless lines. Like a previous poster mentioned, the check replicates the V throughout — the new approach is to use the V in the background of presentations and documents, keeping the equity in the design. The old telecom check will start to fade, as the primary logo and gray tones are a subtle move to a modern look. Red and black is more dramatic than AT&T telco blue. Overall, I think the z is less useful than the V, and the font choice should be less heavy. It is actually a V, not a check mark, so it does have relevance. It also balances the red z out somewhat. Check the Latin origin of the name and it may become more clear to you. With that said, the logo could use some work to make it a little less masculine. I’m with you, John . . . I don’t like the logo. I think it would be interesting to hear from the design team who created the logo . . . if they could talk openly . . . and hear what they had to say about it . . . why they did what they did. There are some really interesting points here. I think the most logical conclusion must be that it met the company requirements for a transitional logo. It would be really interesting to see what was rejected and what direction they are planning on taking the logo. This is the new(ish) logo of the big local telco in New Zealand, Telecom NZ. Why the small superscript NZ, and what is that pale blue circular transparency/fill all about? And I am not that sure about the scribble and the colour choice of that tint of blue. I don’t think any of it works, really. This is a hard call for me. The logo is definitely cleaner and more masculine without the check mark. But more visually unique with the check / “V”. And the check/V mirrors the lower portion of the “Z.” I wish the mirror of the “Z” were more exact and obvious, though. I have hated the Verizon logo since the moment I saw it. First of all, even then, it had a dated look. But more importantly, it’s awkward to design around; I’ve had many occasions where Verizon was a co-sponsor or branding partner, and it just creates a weird space around it — not to mention the black-and-red colour scheme. The whole thing just creates an awkward shape (the angles, the negative space and the gradients), all adding up to one fugly brand logo. Does anyone know what the word Verizon means or why they chose it? I agree with the comment from World’s Best Practice — “be loathe to criticize another’s work if you’re unaware of the constraints and parameters the designer had to work under.” If you think the Verizon logo is difficult to work with, you should see my employer’s logo. It was designed about 20 years ago; it was ugly and awkward then, and it’s ugly and awkward today. Nothing looks good with it. On the other hand, maybe I’m just a crappy designer. Perhaps someone more talented could do a better job of incorporating it into the many marketing and promotional pieces I produce. In any event, the Verizon designer may not have had any choice in the check-mark debacle. Good discussion, though. Totally agree with removing the check mark — it looks much better without it. I find the check mark so annoying. Even seeing the logo on a beautiful phone repels me. The red checkmark subconsciously indicates to the customer that this company is the one to “choose” or go with in the eye of the consumer. Not necessarily best quality design but obviously does the job for Verizon’s advertising, marketing and promotion of their product lines. To me, an even bigger issue is the meaning of the prominence of the “z”. Is it in some way special or symbolic? Or is it just emphasized so that it doesn’t sound as out of place when randomly thrown into the middle of VZW? This is the only value it appears to add to the company’s initials, being that in order to actually make any sense the company would have to be called Veri Zon Wireless (as this is how intialisms work). If they insist on three letters, it should be VWL, because at least wire and less are words on their own, even if they would not make sense in that context.